The view from my breakfast table this morning was of the sunrise hitting the magnificent Acroplis in Athens. Can't get must better that this. P.S. the scaffolding has been there for almost decades (since 1975), although it seems a little less these days, since the Eastern facade is finally free of scaffolding. It is estimated to take another 20 years for the restoration. Superb shot and a beautiful view! Very interesting structure and the light is just right. 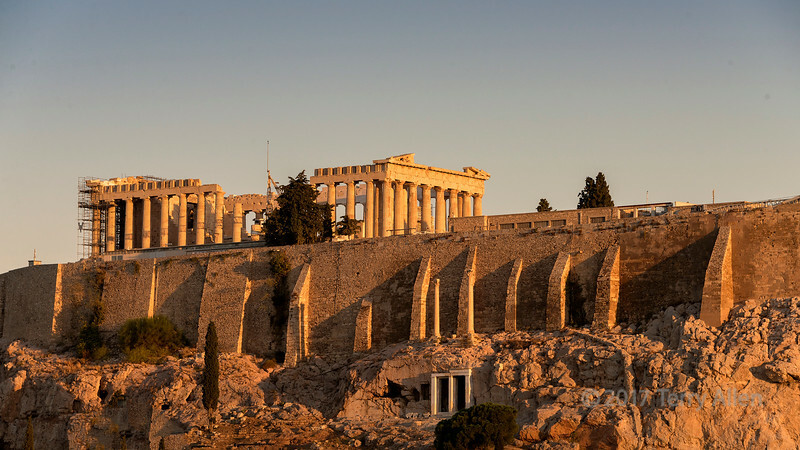 Beautiful light on the Acropolis. ...And I thought 5 years of renovating Himeji Castle was long! Absolutely magic light ! I think Zeus relly wanted you to get this shot !!! Will be a sight and a half when the restoration is finished ! Imagine having this view at breakfast--what a way to start the day! Great lighting on that old brick.